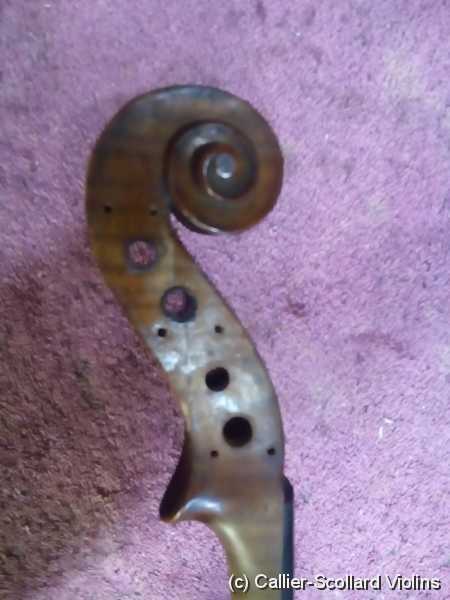 This is a shot of a scroll that was broken once before and repaired by another shop. 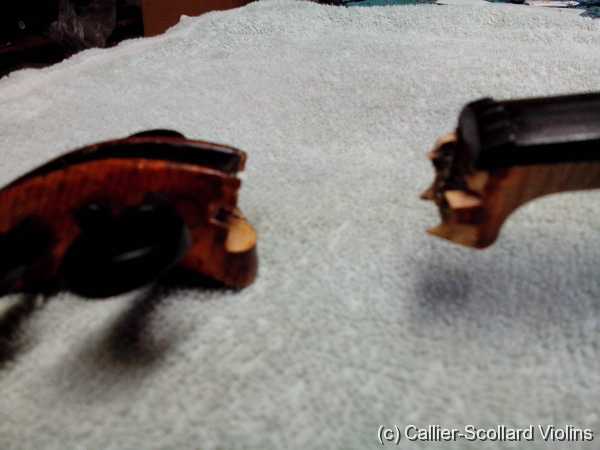 Then it broke again in a slightly different spot and was basically totally sheered off. 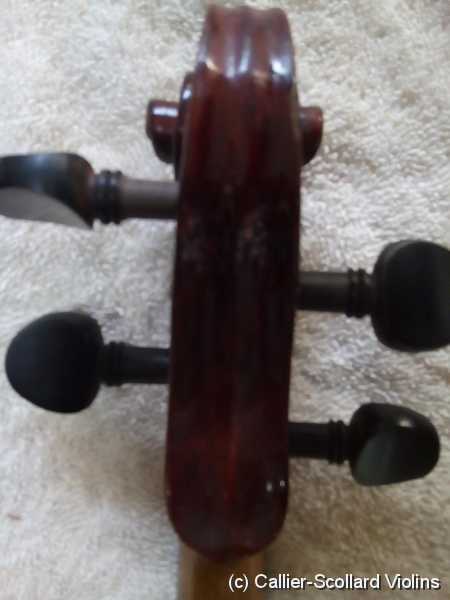 These are the bofore photos, but I can't seem to locate the after photo, but it's nearly invisiable. 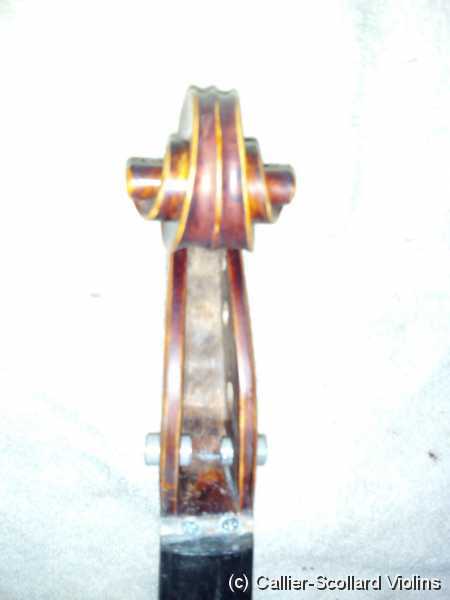 Here is another scroll that was broken, this type of break is more typical. 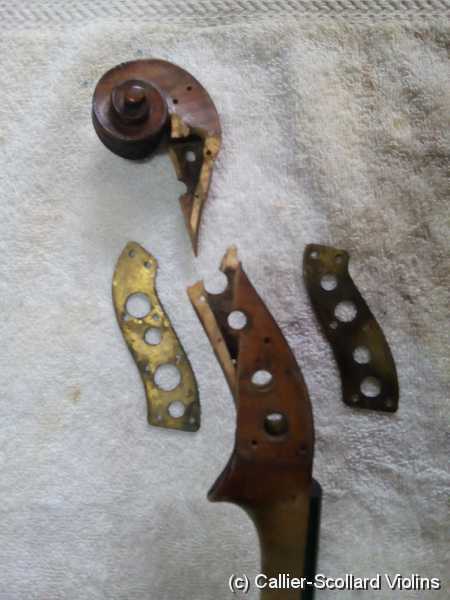 If it goes through one of two peg holes they need to be bushed with a spiral bushing. 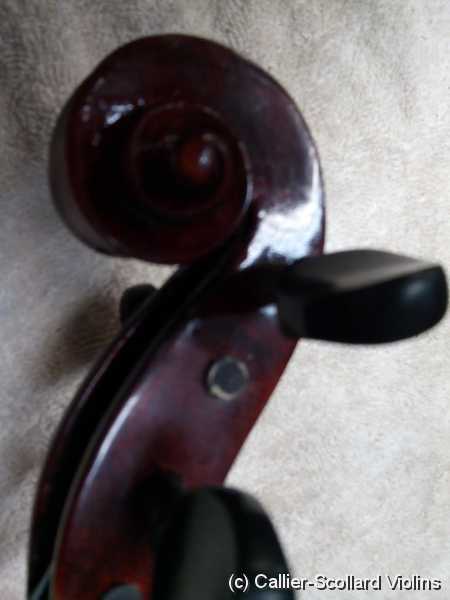 The bushing keeps the peg from expanding the peg hole and opening the crack. 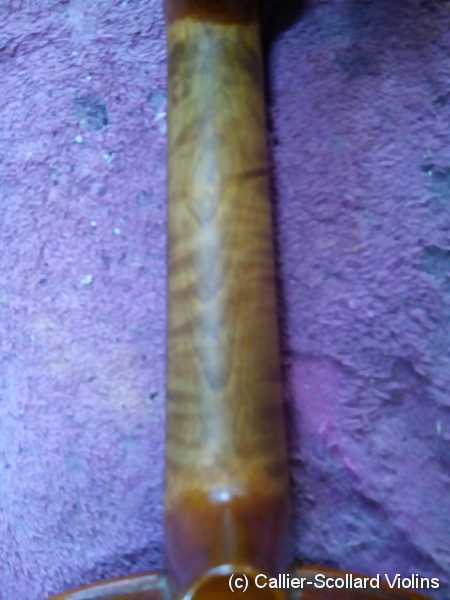 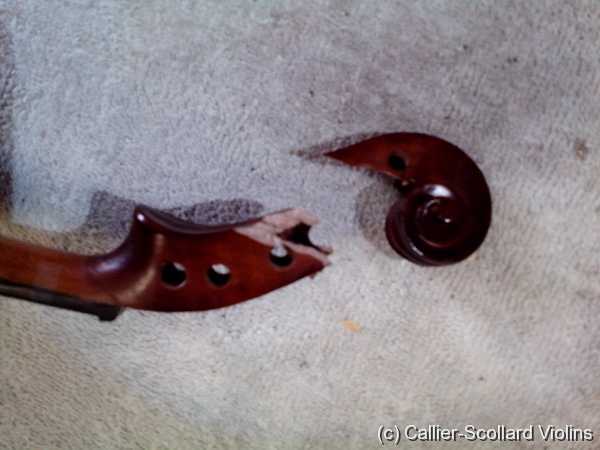 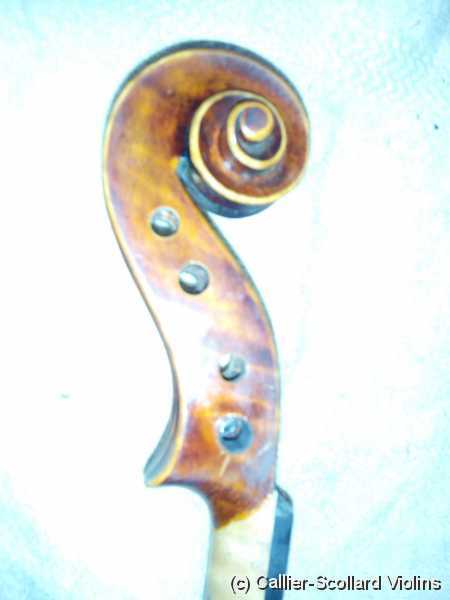 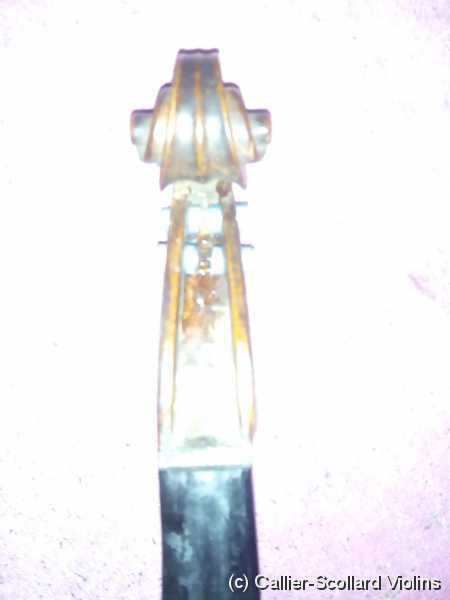 A cello scroll that was broken through the "D" peg hole. 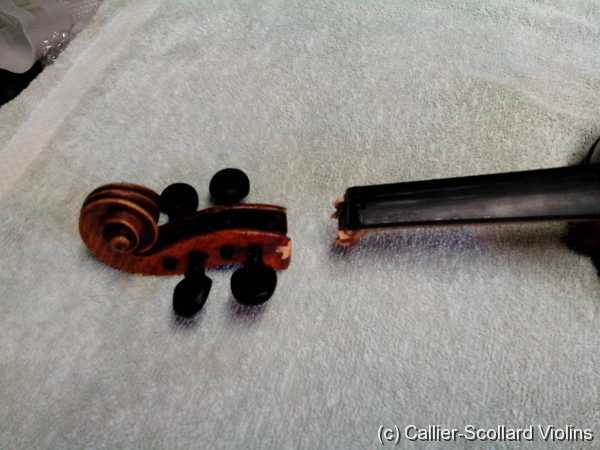 This is a crack in the scroll that did not go all the way through, but it needed a lot of clamping pressure to get it completely closed. 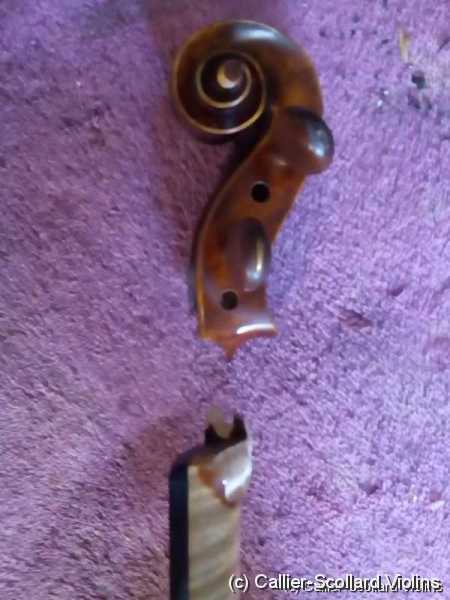 Another scroll broken through the A and D peg. 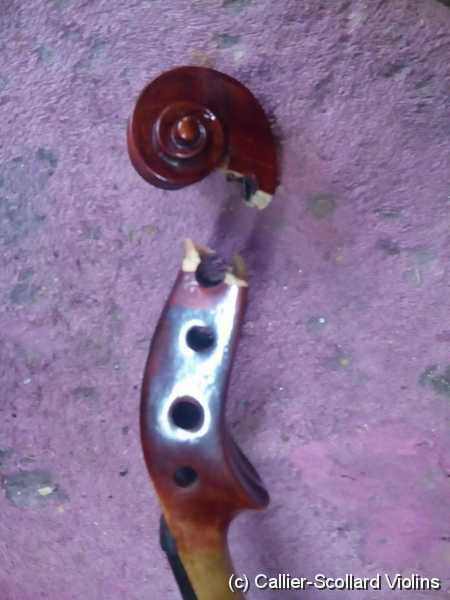 A violin scroll that's broken just where the neck starts, it's a very short break so I needed to put in two stainless steel pins under the nut. 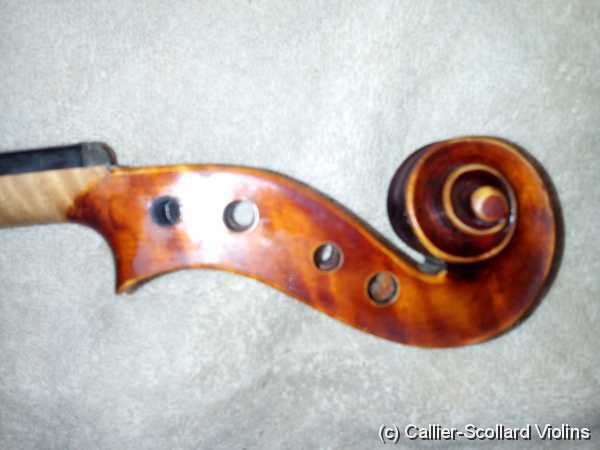 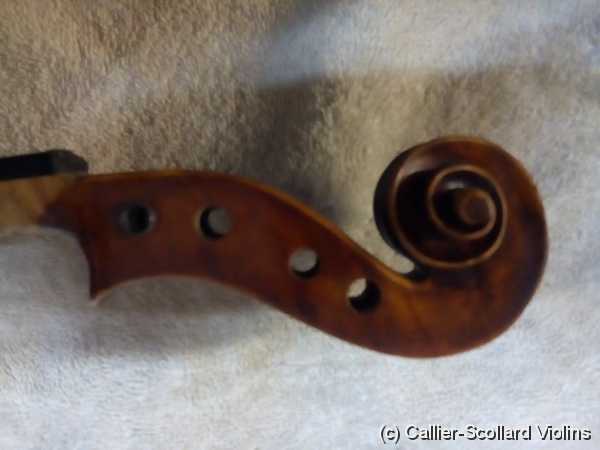 Here is a violin that has a bad crack running through most of the scroll. 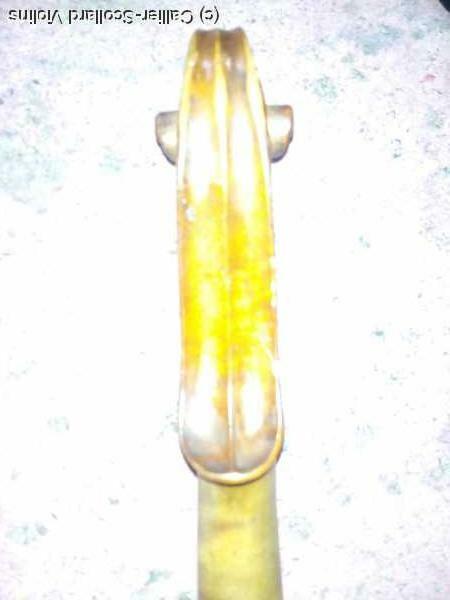 It had custom made brass plates that were screwed onto the sides. 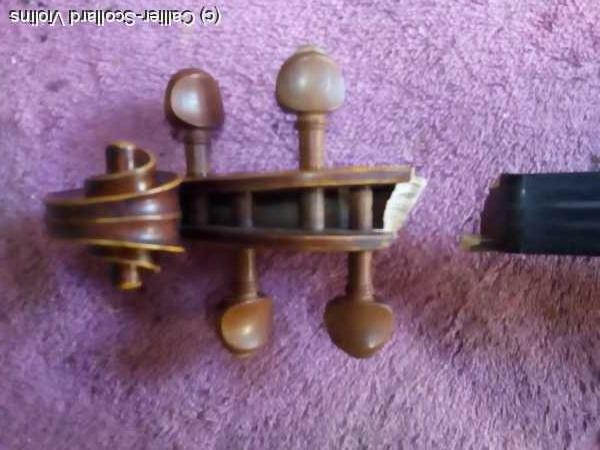 The crack was completely open and only the plates were holding it together. 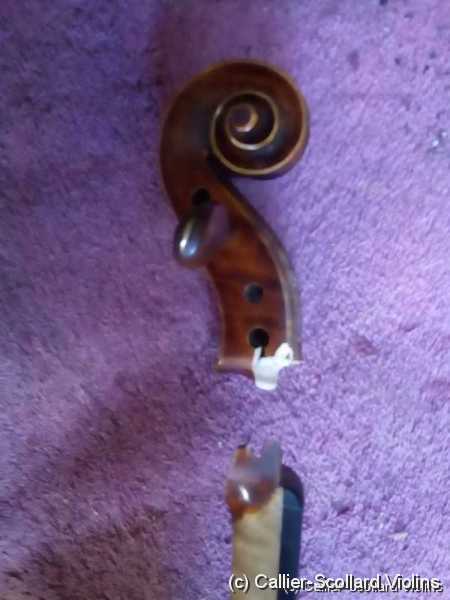 My cello scroll broke off from the d-string peg hole. 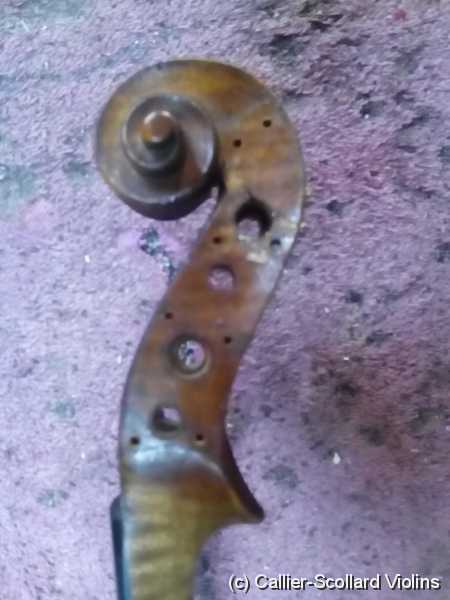 How much would it cost to repair and how long?? 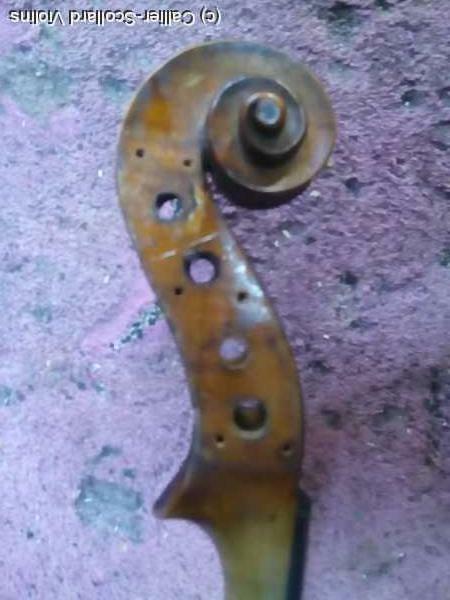 Also how do you repair it? 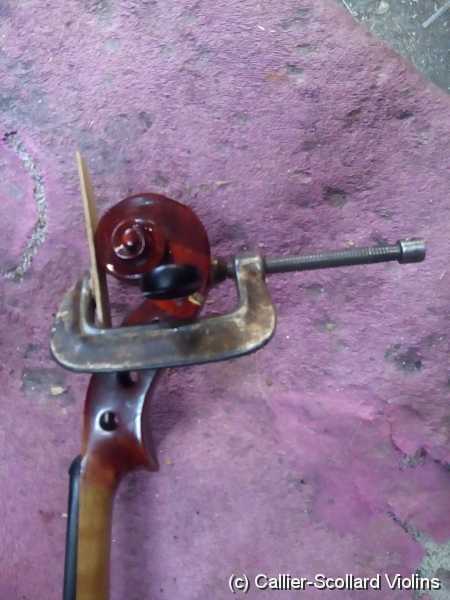 Most likely it can be fixed. 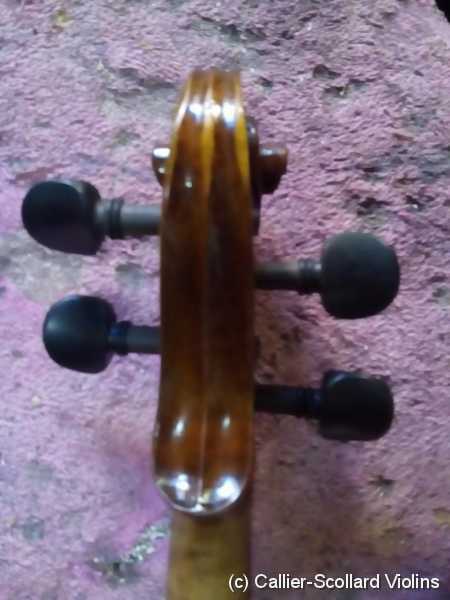 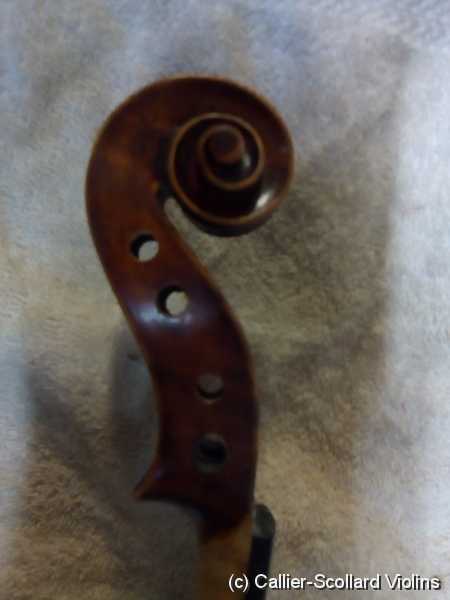 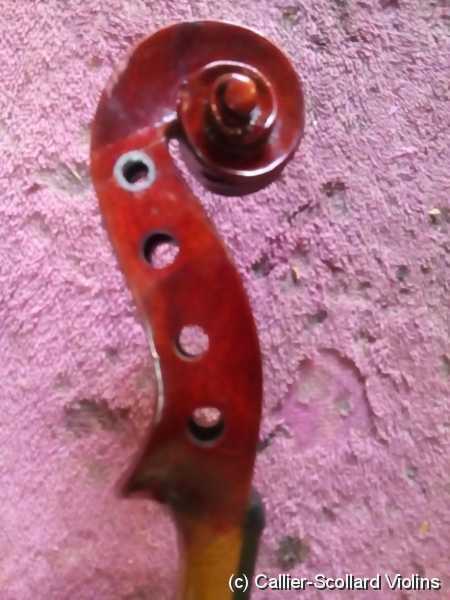 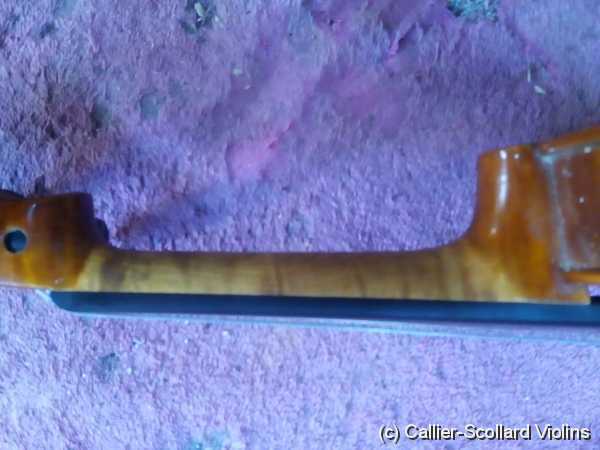 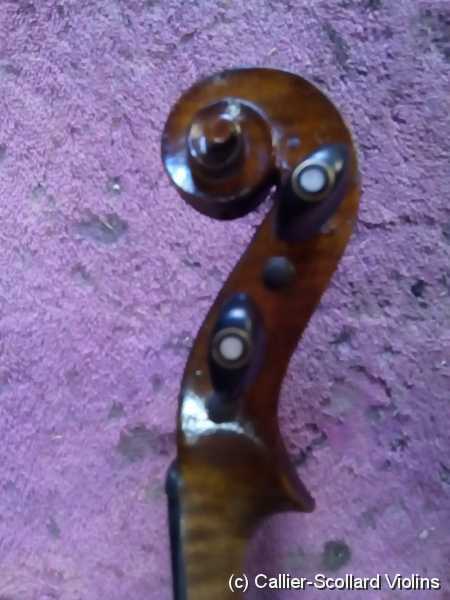 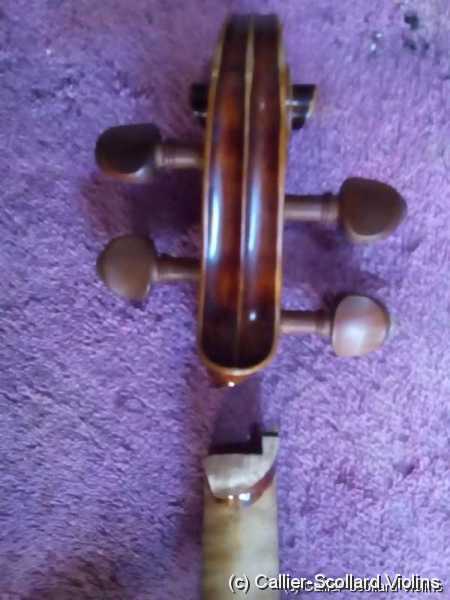 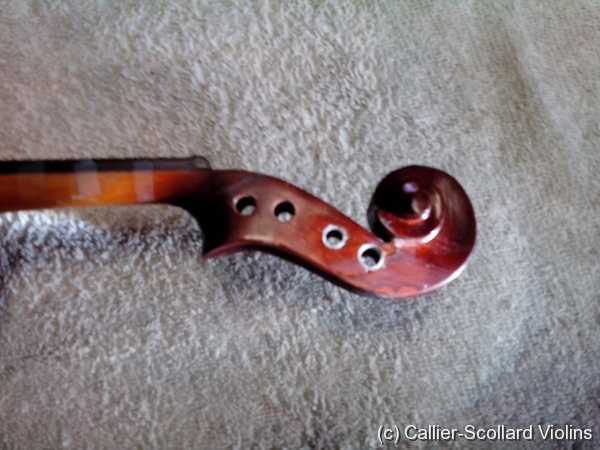 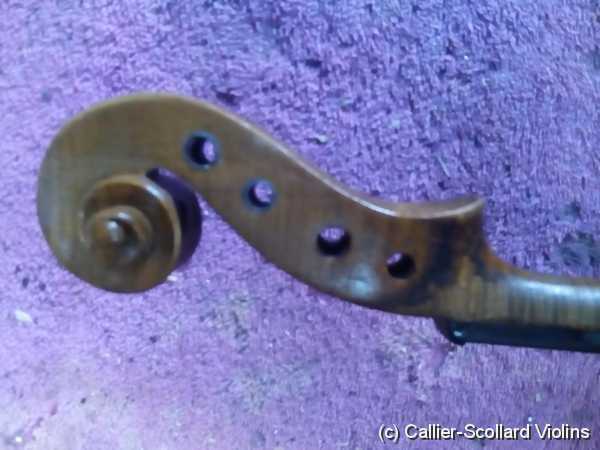 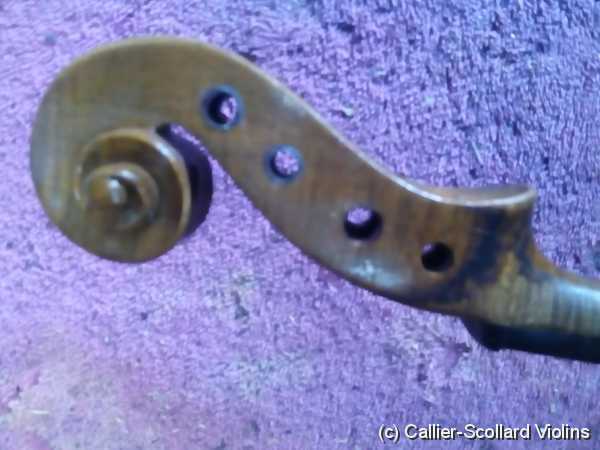 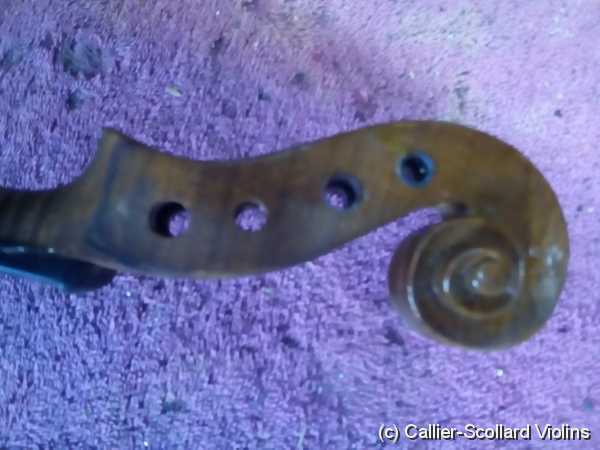 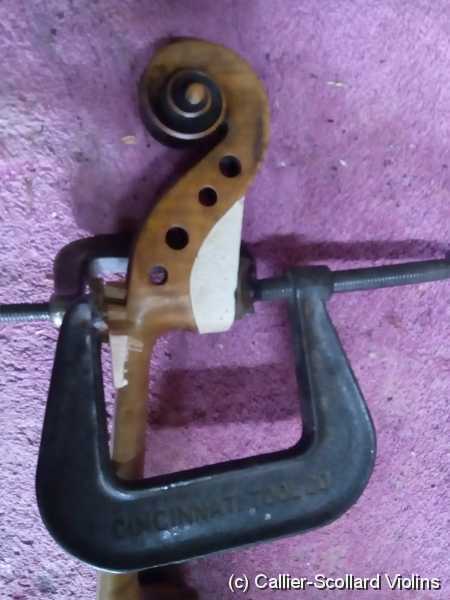 If it's a somewhat normal break and an average cello, my guess would be around $80 for the break and about $35 to bush the D peg hold, but I would really need to see it to give you a price and determine how it would be repaired. 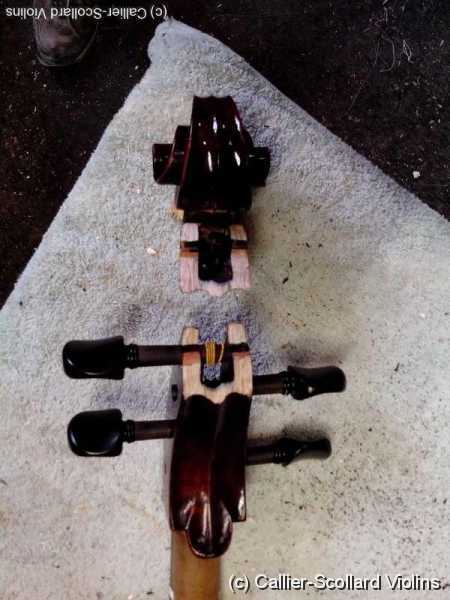 Currently I'm swamped with work so it would take about 3 weeks. 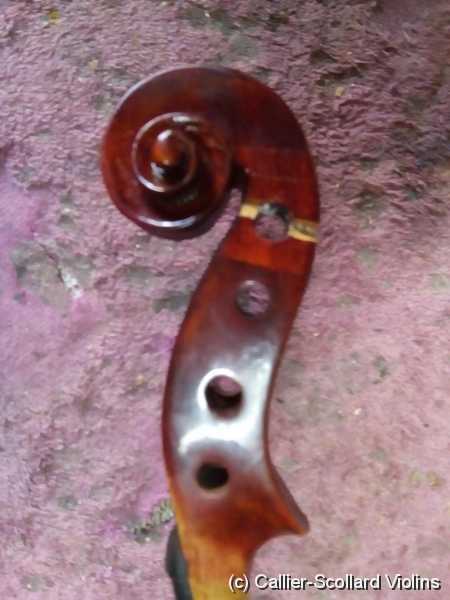 One if my students fell on a viola and cracked the scroll in half is this repairable if so how much will it cost? 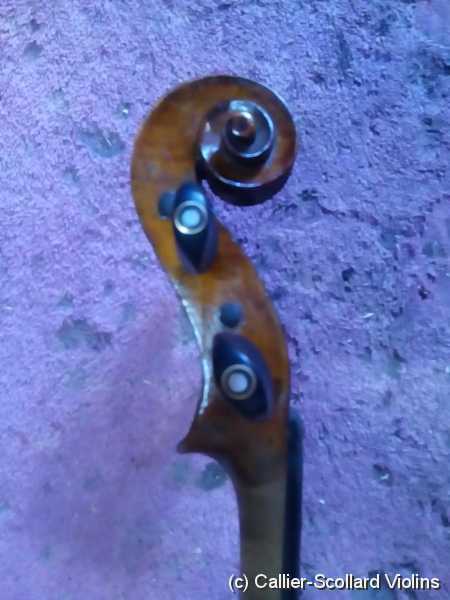 i am not a orchastra teacher but i am a math teacher and this happend to a students personal instrument. 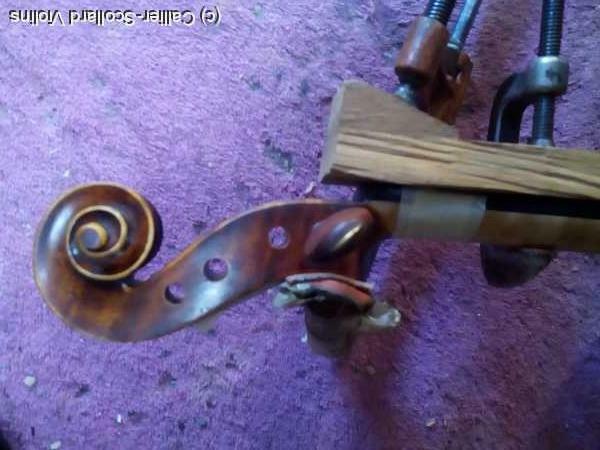 I would need to see how the scroll was broken, but most likely it can be repaired. 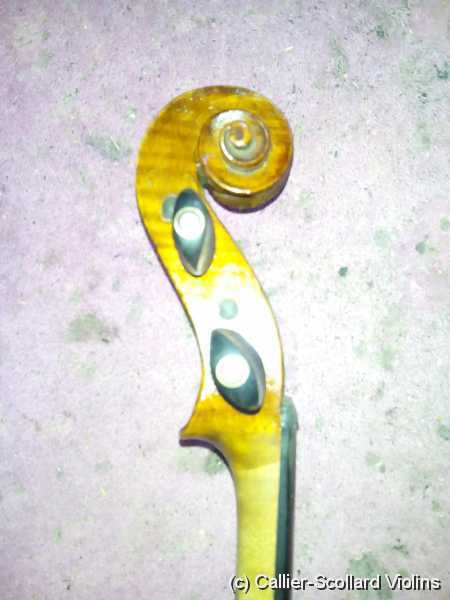 Thank you so much for the information but my student has taken it to get fixed already. 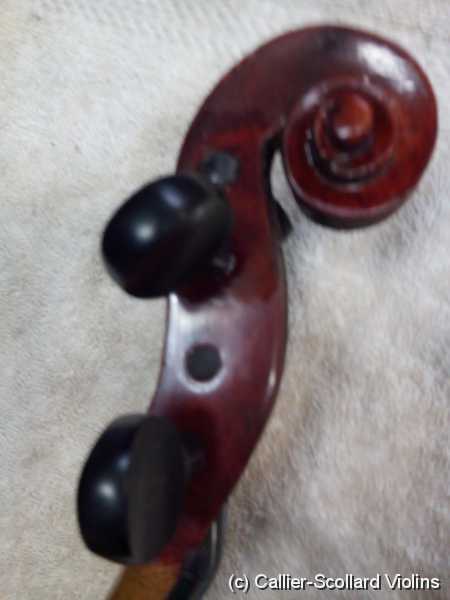 I have a violin that had a hairline crack running to the peg holes. 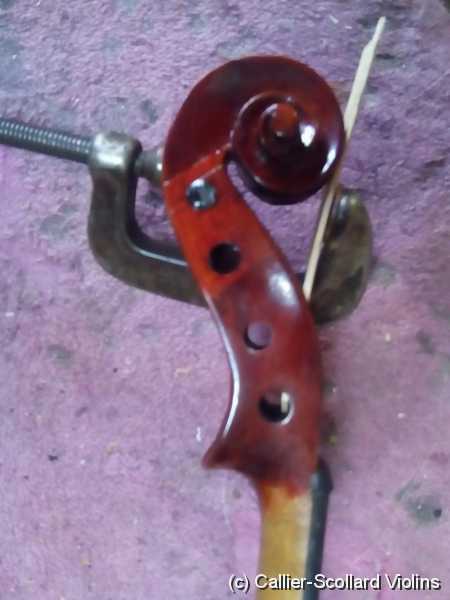 The peg slips and opens up the crack line as I try to tighten the string but the peg won't stay put under the pull of the string. 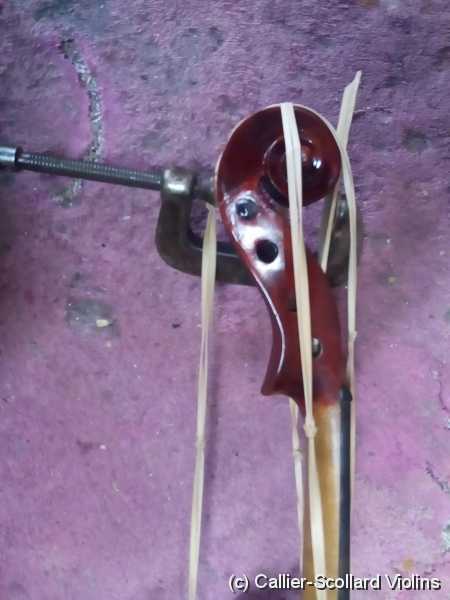 Can simple gluing together suffice or you will need bushings. 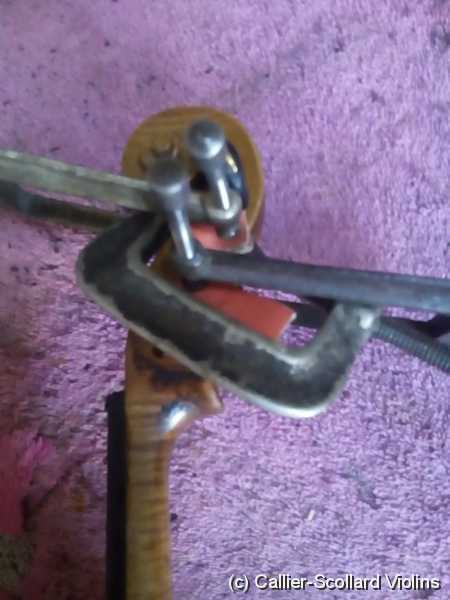 I don't see a fee listed for bushings. 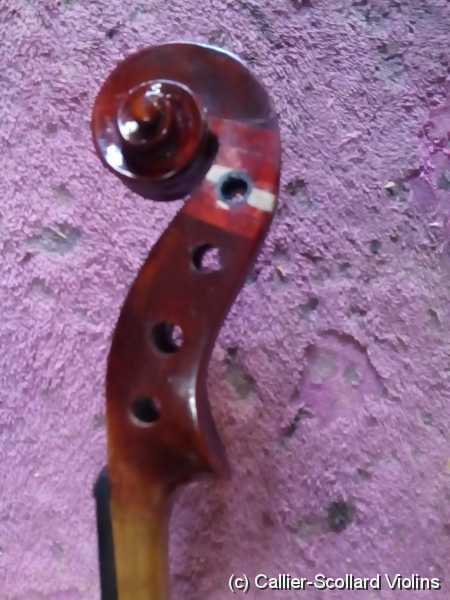 What is the repair cost . 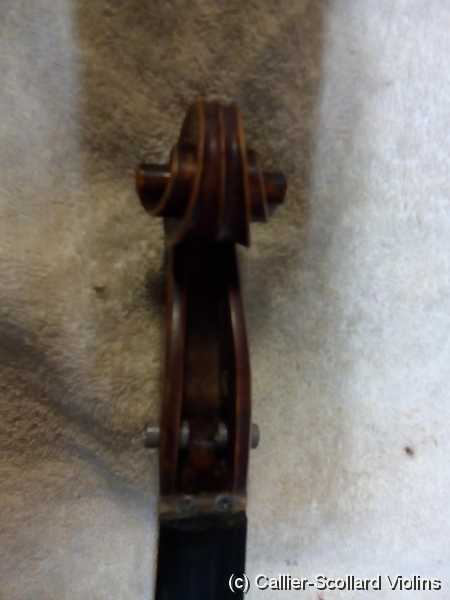 If the crack runs through the peg hole then it needs to be bushed. 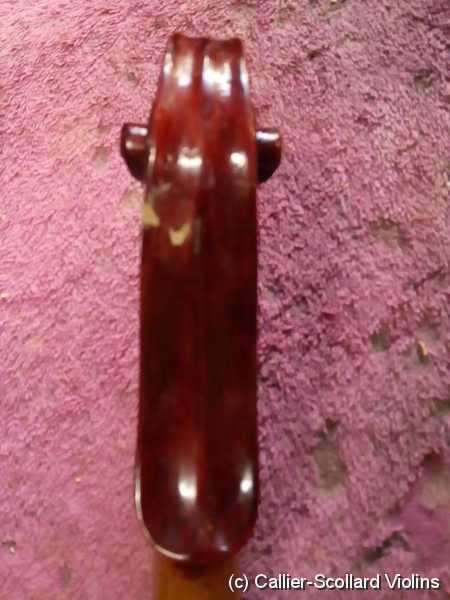 Since the peg is tapered when it's pushed into the peg hole, it will always be creating a force that's trying to expand the peg hole. 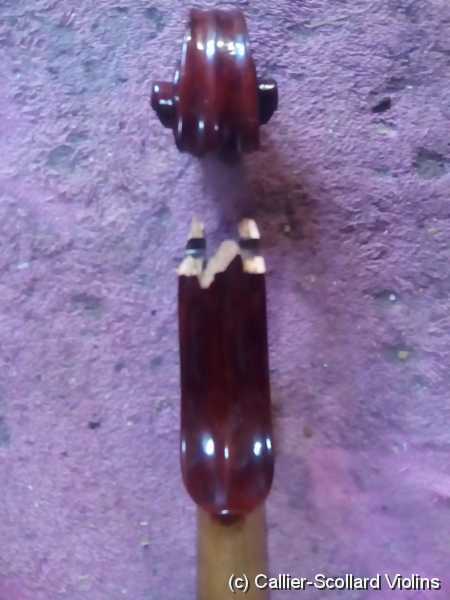 If you use a spiral bushing that makes two revolutions inside the peg hole, the bushing will withstand the force and the crack will not open up again. 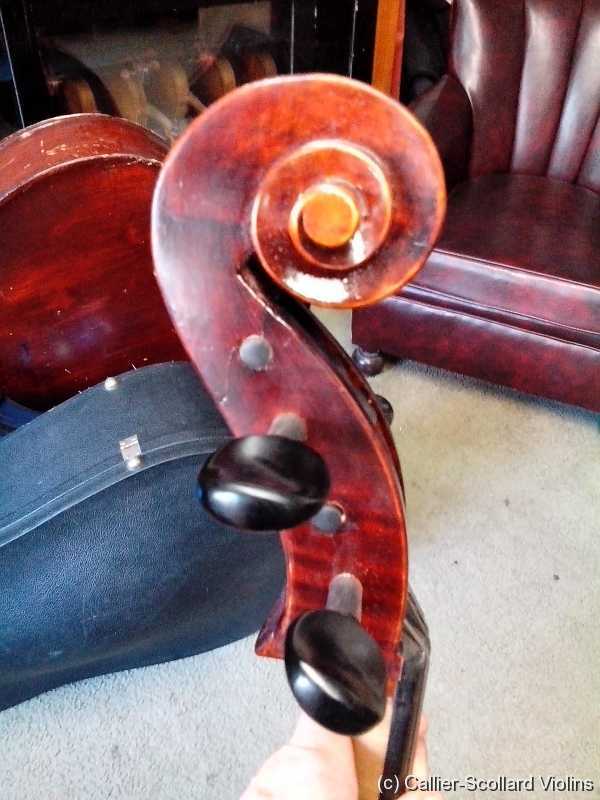 I would really need to see the instrument to give you a price.